Thanks to production that is just as reliable as it is flexible, the SBZ 628 offers excellent cost efficiency. 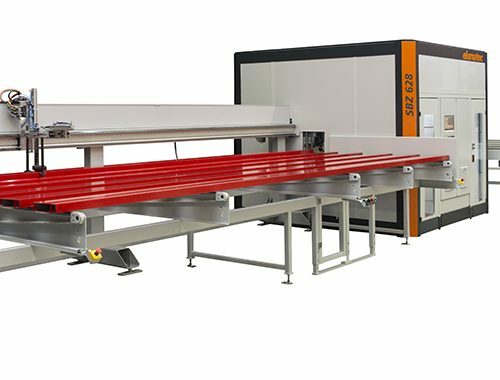 It is possible in a single pass to employ up to eight different tools thanks to a rotation module, as well as to accomplish length cutting both simply and quickly. With its pivoting grippers, the router spindle that can be rotated by 360° and the infinitely variable saw blade, the SBZ 628 can process profiles in diverse clamping situations – always at a constant, high level of precision throughout the entire work cycle. The combination clamping system secures the exact position of the profiles and ensures fast processing. Quick-change systems for the gentle guide rollers and tools shorten machine set-up times when required. The centre is designed for one-man operation and in spite of its space-saving layout, it still has a large loading magazine as well as an unloading magazine to ensure an interruption-free production flow. The generously dimensioned noise abatement enclosure and the easy-access controls and maintenance elements simplify operation. The system is controlled using the intuitive eluCad software from elusoft.